Contest Description. Empire's 2013 Costume Contest (the "Contest") is designed to encourage eligible U.S. entrants ("Entrant(s)") to express their creativity in putting together and wearing a costume. Empire's Comics Vault's fans will choose the winning entries via an online poll at http://www.EmpiresComics.com. Prizes will be awarded in accordance with these Official Rules. This Contest is in no way sponsored, endorsed or administered by, or associated with Facebook, Inc., Google, Inc., or any other social media sites used to promote this contest. Eligibility. This Contest is open to any legal resident of the United States age eighteen or over, except employees, agents, or representatives of the Sponsor. Only one pumpkin per Entrant is allowed. At the time of submission, each Entrant must be a U.S. citizen or a permanent U.S. legal resident (e.g., must be able to show proof of legal permanent residence, for example, a "green card"). Employees, interns, contractors, and official office-holders, as well as their immediate families, of the Sponsor, its affiliates, and any representatives or agencies of the Sponsor or other persons professionally connected with the Contest are not eligible to participate. This Contest is void where prohibited. How To Enter. To enter, submit to the Sponsor via email a photograph of yourself in costume while holding a current comic book ("Entry"). The Sponsor's email address for submissions is "empirescv@gmail.com." 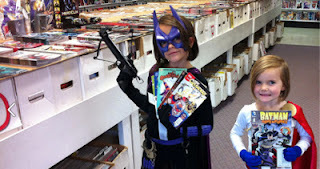 Contest Rules and instructions are posted at http://empirescomicsvault.blogspot.com/search/label/Costume%2013 ("Contest Website"). Entries sent by means other than email to email address listed above will not be considered eligible entries. Submissions must be: (i) complete (as determined by Sponsor); (ii) received no later than October 31, 2013, by 11:59:59 P.M. Pacific Time (PT). Any submission not meeting the aforementioned criteria will be disqualified. The Sponsor accepts no responsibility for submissions lost, delayed, damaged, defaced, or mislaid, howsoever caused. Selection of Winners. Entries will be judged by any person who participates in the voting process by voting for their favorite entry using the online poll found in the righthand column of our website at http://www.EmpiresComics.com available on November 2, 2013. Decisions are final and binding. In the event there are not enough eligible entries, not all prizes will be awarded. If a winner is not able for whatever reason to accept his or her prize, then the Sponsor reserves the right to award the prize to another Entrant. Online public voting starts on November 2, 2013 at 5:00:00 A.M. Pacific Time (PT) and closes on November 10, 2013 at 9:00:00 P.M. Pacific Time (PT). Empire's Comics Vault will then select the three entries with the most votes to receive prizes. In the event of a tie, two prizes will be awarded at the level that the tie occurred. Prizes. One (1) Grand Prize: The entry with the most votes will receive $50 in store credit. One (1) 2nd Place Prize: $25 in store credit. One (1) 3rd Place Prize: $15 in regular-priced back issues. Intellectual Property. By registering for the Contest and/or submitting an entry you agree explicitly that your submission is indeed an original creation. Any intellectual property infringement, misuse or plagiarism of another’s work in any form or state will result in immediate disqualification and forfeiture of eligibility to receive all awards, recognition and prizes. You also agree to allow the Sponsor to make public statements regarding any disqualifications and any grounds for disqualification. All intellectual property and industrial property rights in any entries that belonged to the Entrants will remain with the Entrants, but the submissions will otherwise become the property of the Sponsor, and will not be returned after the Contest. You grant the Sponsor permission to use, copy, modify, distribute, and publicly display your Contest submission for any purpose, including display on the Sponsor's website, without any attribution or compensation to you.